Community News Sites should engage their users, use quickly social media tools, tease out contributors rather than train citizen journalist in advance, according to a new J-Lab report released this week. I found this J-Lab Report, which culled lessons learned from five years of funding community news startups, to be informative and worth reading. If you are thinking about becoming a news entrepreneur, take the time to read this report. It’s about 36-pages long. The report, “New Voices: What Works,” documents the track record of 48 community news projects launched since 2005. These projects were created with small grants from J-Lab: The Institute for Interactive Journalism at American University. The John S. and James L. Knight Foundation funded the grant program. “One of the most important contributions of all of the New Voices community news sites is not that they replaced news coverage that has been constricted – rather they added coverage that did not exist before, not even in the heyday of American journalism,” said Jan Schaffer, J-Lab director, in releasing the report. “The report shows that New Voices projects have added perspectives to community debate while serving as important experiments,” said John Bracken, Knight Foundation’s director of digital media. Engagement, not just content, is key: Robust and frequent content begets more content but it’s the engagement with users that make sites successful. Citizen journalism is a high-churn, high-touch enterprise: Citizen journalism math is working out this way: Fewer than one in 10 of those you train will stick around to be regular contributors. It’s better to nurture frequent site visitors to generate content. Social media is ushering in a new era for community news startups. Sites that build on friend networks are launching with lightning speed. Sweat equity counts for a lot: Projects built on the grit and passion of the founders have created the most promising models for sustainability. Community news sites are not a business yet. Income from grants, ads, events and other things falls short, in most cases, of paying staff salaries and operating expenses. 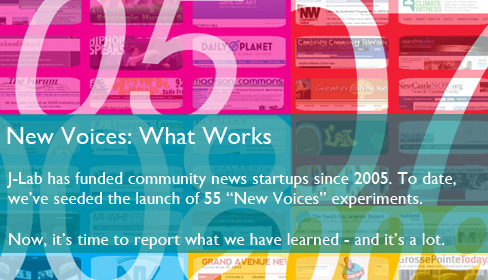 The New Voices program, launched in 2005, awards start-up funding to news entrepreneurs to create community news sites. Through 2010, 55 projects were funded from a pool of 1,433 applicants. The report examines the 46 projects funded from 2005 through 2009. Nine other sites funded this year will launch over the next six months. Go here to view or download the report.